This pinball masterpiece was designed by the legendary Pat Lawlor, designer of Dialed In!, Twilight Zone, and over a dozen other classic games, including the best-selling pinball machine in history, The Addams Family. 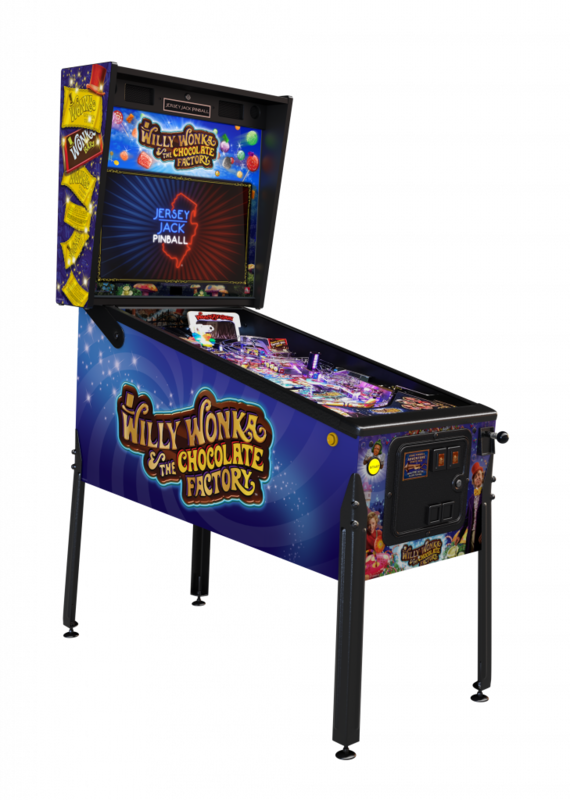 All models of Willy Wonka and the Chocolate Factory™ pinball include four flippers, six balls, a captive ball, seven magnets, the Everlasting Gobstopper™, the Most Secret Machine™, Oompa Loompa™ camera sculpture, 7” Wonkavision™ LCD, a 27” HD LCD screen with interactive 3D animations, and candy-colored LED light shows. Gameplay features four multiballs, collecting Wonka Bars™, spelling Scrumdiddlyumptious™, touring Wonka’s Factory™, and a host of other goodies to lead you down the chocolate river to three wizard modes, including Pure Imagination™. Scenes and dialogue from the original 1971 film directed by Mel Stuart, starring Gene Wilder, are showcased bringing this exciting theme to life. Website content, text, & images Copyright ©2015 Classicgamerooms.com - Your Game Room Superstore - All Rights Reserved.